For College of Law alumna Melissa Olivero, strength of character and a keen sense of justice have led to service in an elite group. Olivero is a National Labor Relations Board administrative law judge, one of only 40 in the country. In this role, she has the authority to docket, hear, settle, and decide unfair labor practice cases across the nation. Olivero, who holds a bachelor’s degree in political science from the University of Michigan, transferred to her current position after serving as a judge with the Social Security Administration for two years. Before joining Social Security, she spent six years as a trial attorney with the Peoria office of the National Labor Relations Board. She also spent several years in private practice and as an assistant state’s attorney in LaSalle County. Olivero has also served her country. She spent four years in the United States Army and four years in the Army Reserves as a platoon leader and company commander. She attained the rank of captain and received an honorable discharge in 1998. Currently, Olivero is the chair of the Illinois Valley Community College Board of Trustees. 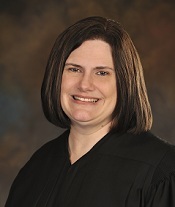 She has been appointed to the Illinois State Bar Association Assembly and is a member of the National Association of Women Judges, the Federal Administrative Law Judges Conference, the Zonta Club of LaSalle-Peru, the judicial division of the American Bar Association, and the American Legion. From 1998 to 2013, she served as a member of the NIU College of Law Alumni Council. In 2013, Olivero was appointed to the Third Judicial District Committee on Character and Fitness. In 2010, she was named the Illinois Valley Woman Making History by the Zonta Club of LaSalle-Peru. In 2014, she received the Alumni Association Outstanding College of Law Alumni Award.